ProSilva Ireland is delighted to reprint an article from the Irish Farmers Journal by Donal Magner. Donal reviewed in detail the recent ProSilva Ireland and the Society of Irish Forester’s field day at Ballyhooly forest in North Cork, managed by Coillte. Our thanks to Donal Magner and the Irish Farmers Journal. Lesson one. The ways to propagate a tree are many. From Georgics by Virgil (29BC). Translated by PeterFallon (2006). In Georgics,Virgil described six ways to propagate trees. He began with three types of natural regeneration or ‘Nature’s way for each and every tree in woods and sacred groves to thrive and flourish’. These were followed by three ‘other ways, found out by trial and error’; in other words, where man intervenes to plant or coppice. Like many other countries, Irish foresters and forest owners rely on one method of establishing forests. Virtually all private planting is carried out in bare land, so the choice of establishment is limited to manual or mechanical planting of trees, sourced from forest nurseries. Forest management practice is simple in Ireland: establish a crop; thin it every four or five years when it reaches pole stage; clearfell on maturity, and start all over again. Final harvest is the big payday for forest owners with revenue of up to €25,000/ha for some clearfelled crops. The owner allocates 12% to 15% of this income for reforestation and waits for 15 to 20 years, on average, for the next paycheque. The organisation ProSilva Ireland proposes a different silvicultural approach to forest management, known as continuous cover forestry (CCF), sometimes referred to as close to nature forestry or irregular forest management. CCF maintains continuous woodland cover — ‘nature’s way’, as Virgil said — and continuous income as opposed to the practice of clearcutting. 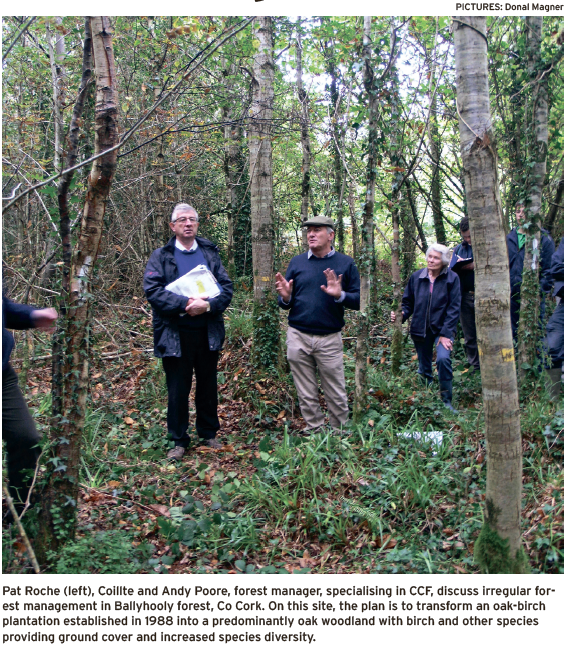 ProSilva teamed up with the Society of Irish Foresters recently to demonstrate the potential of CCF in Ballyhooly forest in north Cork managed by Coillte. The field day was led by Coillte foresters Pat Roche and Pádraig Ó Tuama, both well placed to talk about CCF. Pat Roche, a native of Ballyhooly and manager of the company’s South Munster Business Unit, is familiar with this terrain along the Blackwater valley, while Pádraig Ó Tuama is chairperson of ProSilva Ireland. The organisers invited Andy Poore to provide advice on CCF, backed up by his practical experience as a forester in managing a number of large private estates in southern England according to the principles of CCF. The main message from Ballyhooly is that it is never too late to transform a conventionally managed plantation to CCF. The sites visited in Ballyhooly ranged from a native plantation to mainly coniferous forests established since 1971. The lowland forests were established on old woodland sites dating to 1830 and purchased by the then Forestry Division in the 1930s. As Pat Roche pointed out in Gurteen Wood, the soils are ideal for diverse forestry. Located close to the River Blackwater, they are mainly brown earths where limestone and old red sandstone parent rock converge. This was evident at the first stop in a mainly western hemlock crop, planted in 1972, but also carrying Douglas fir, some Sitka spruce and scattered broadleaves. The stand had been thinned in 1994, 1999 and 2010 and will be thinned again next year. Final harvest, planned for 2025, will not now take place as the area has been earmarked for CCF. Andy Poore maintained that even though the crop was mature, it wasn’t too late to transform it from an even-aged to an irregularaged crop. He advised foresters to change their thinking when managing and thinning for CCF. The advice is to forget about regular spacing. Uneven spacing creates more space for crowns to grow and sunlight to reach the forest floor where smaller trees can emerge or where new growth is encouraged. In this predominant western hemlock wood, there is an opportunity to recreate a forest whereby Douglas fir will eventually be the main crop. It will require a number of thinnings with the emphasis on removing larger and low-grade trees. Western hemlock is a prolific natural regenerator so, if you lose control, you may need to plant Douglas fir if this is the preferred species. In addition, permanent extraction paths 30m apart should be constructed from the beginning to optimise timber removal, continuous crop inspection and thinning. The Douglas-hemlock site was one of six demonstration sites where CCF offers a long-term irregular forest solution. Other sites were more challenging such as a nearby birch-Sitka spruce stand. The birch, which was poor quality, had increased from 20% stocking to 80%, so the objective was to remove most of the birch and allow Sitka to succeed. There was also an opportunity to extend the Douglas fir-western hemlock stand into the Sitka-birch area. The third site was a mainly oak plantation established in 1988 and is now close to first thinning. Again, the birch is intruding so the plan is to remove large birch and select 100 well-formed oak trees per hectare. Eventually, oak will be the predominant species but birch and other species will provide ground cover and increased species diversity. The group also visited the nearby Castleblagh property where the discussion included timber quality, adding value and the economic aspects of CCF in predominantly coniferous stands. One site contained adjoining blocks of Sitka spruce and Douglas fir. Planted in 1988, both were performing well and ready for second thinning. The Sitka spruce has a yield class of 24 (m3/ha/annum), while the Douglas fir is 22. The group also visited an older Douglas fir site — planted in 1971. Again, the silvicultural procedure is similar to the other sites regardless of species mix. The aim is to transform the stand to a predetermined state which includes the desired species mixture, standing volume and eventual multi-age mix to achieve the best possible timber quality and a wide variety of locally adapted species. CCF has potential in Ireland, especially for private growers whose average forest size is close to 10ha. It doesn’t provide the large paycheque at clearfell stage but the trade-off is a continuous income stream. Although many of the ProSilva Ireland field days have been in broadleaved woodlands, the system is suitable for pure conifers, pure broadleaves or broadleaf-conifer mixtures. 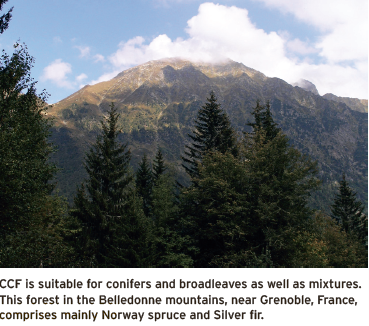 When I visited the Belledonne mountain range near Grenoble with ProSilva, many of the higher altitude forests comprised mainly Norway spruce and Silver fir. CCF requires intensive management. It will result in the long term in much larger but fewer trees. In areas I visited in France, the average yield per hectare was similar to conventional thinning but as few as 10 trees were removed per hectare. These averaged between 4m3 and 7m3. Each tree to be harvested is hand picked so, as Andy Poore pointed out, selection has to be carried out by foresters or fully trained personnel. They select and harvest the biggest, best and most valuable trees all the time, encouraging the smaller trees to rapidly fill the space of the removed trees. Sawmills in areas such as the Swiss and French Alps are geared to handle large logs, which is not the case in Ireland. However, specialist sawmills would have time to adapt to changing log sizes that will take generations to achieve even if there is a large-scale shift to CCF. Pádraig Ó Tuama, Paddy Purser and their ProSilva colleagues maintain that the economics of CCF compare well with plantation forestry but they also cite other benefits which far outweigh conventional plantation management. These include conservation, species diversity and soil protection.The properties visited in Ballyhooly present a range of opportunities and challenges in the transformation of forests to CCF. The creation of a CCF centre of excellence in Ballyhooly would offer a major opportunity to explore the economic, social, environmental and silvicultural aspects of irregular forest management. This article was first published in the Irish Farmers Journal on 12 October, 2013. Time for some GOOD NEWS !..Let’s hope this type of forestry becomes the norm rather than the exception in the coming years. Thank you so much for re-blogging and sharing this article. Incidentally, Continuous cover forestry is being mentioned in some political policy already but more people knowing about it will help its adoption.